Ladies and gentleman, get ready for a clinic in peaking at the right time. The fact that Sierra Sankey and Kailey Woody have yet to break 22:00 this season is almost as baffling as the run that Fatima has put together over the last five years. But Fatima's 5th and 6th runners appear ready to guide the Comets to their sixth straight state title. We'll start with Sankey. For the third straight year, she comes in with three or fewer races under her belt on the season. As a result, she hasn't posted a career best time, but that could be coming on Saturday. Sankey finished in 7th at the Class 2 District 4 meet, behind four of her teammates and Steelville's Allie Gibbs and Breann Church. The Fatima junior was only 30 seconds behind a slightly hobbled Gibbs who will still be a contender for the state title on Saturday despite a knee issue. But it is not her finish at the district meet that makes her a sleeper, it is a past that includes a 21:51.06 performance at the 2017 Capital City CC Challenge and a 21:26.95 from the 2016 Show Me Conference held in Linn. Finally, Fatima has perfected the state peak which is why we think it will not be wasted on Sankey this year after she posted an 80th place performance in 2017. As for Kailey Woody, this season's best should be coming down the pipeline this weekend. Woody is currently ranked 82nd in Class 2, but that doesn't paint the whole picture for the junior. In 2017, she finished 23rd in 21:01.19 and in 2016 she dropped 43 seconds off her season best to finish 16th in 20:50.38. How could you deny someone with such a resume a third medal? 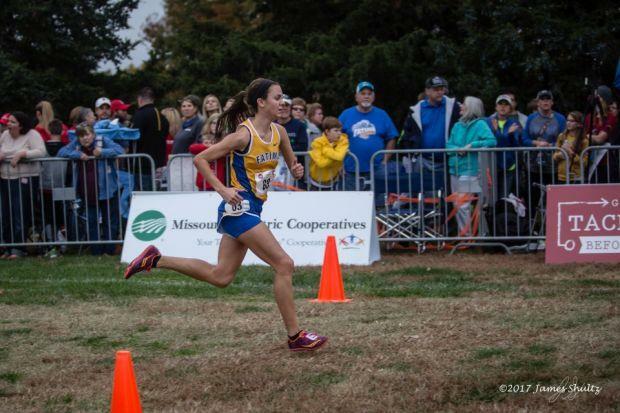 She's going to need another massive time drop like she had in 2016, but if she drops 43 seconds off her season best again this year, she will be right around that 21:00-21:10 area it typically takes for a state medal in Class 2.